The two departments would merge into the Department of Education and the Workforce (DEW), aimed at "meeting the needs of American students and workers, from education and skill development to workplace protection to retirement security," according to a White House outline of the plan. "The new merged department would reduce unnecessary bureaucracy, streamline access and better integrate education and workforce programs, and allow the administration to more effectively address the full range of issues affecting American students and workers," the outline read. 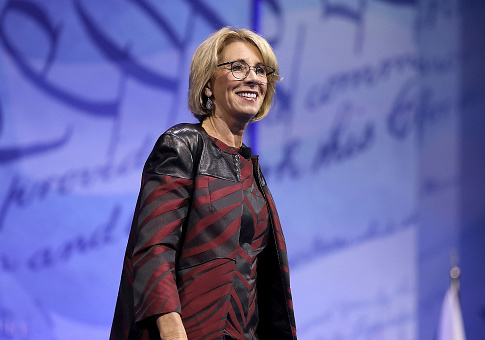 Secretary of Education Betsy DeVos praised the plan and said that it would help break down "artificial barriers" between education and career-development programs. "President Trump campaigned and won with his promise to reduce the federal footprint in education and to make the federal government more efficient and effective. Today's bold reform proposal takes a big step toward fulfilling that promise," DeVos said in a statement. "Artificial barriers between education and workforce programs have existed for far too long. We must reform our 20th century federal agencies to meet the challenges of the 21st century." In addition to combining the Labor and Education departments, Office of Management and Budget director Mick Mulvaney said that he is interested in merging the Department of Agriculture's Food and Nutrition Services into the Department of Health and Human Services, renaming it the Department of Health and Public Welfare. "This is the generational kind of stuff that you asked us to do," Mulvaney told President Donald Trump in a Cabinet meeting on Thursday. "This is what you talked about when you said: Drain the swamp." This entry was posted in Issues and tagged Betsy DeVos, Department of Education, Department of Labor, Mick Mulvaney, Trump Administration, White House. Bookmark the permalink.